Last week I wrote a piece about How to get back into a sleeping routine. 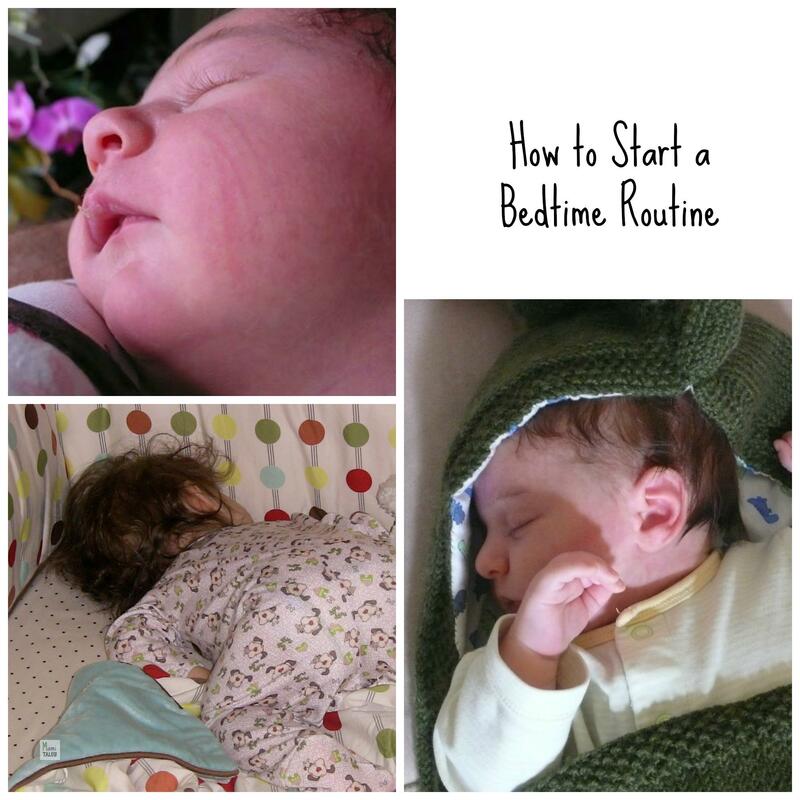 A friend of mine commented that it all sounded like great advice, if only she could get her 5 month-old to sleep for longer than 2 hours and BE in a regular bedtime routine, which gave me the idea to write a post on How to start a Bedtime Routine in the first place. After going through 2 babies, here are the things that I would recommend for new moms with small babies. When should you start your Baby on a sleeping ritual? For me, the first time around, with Little Miss I, it took about 5 to 6 months to start a bedtime ritual. With Tiny A, I started him when he was 2 months-old. The first thing you should do is to establish clearly for your baby the difference between night and day, as soon as they are born. When it is nighttime, change their diaper, feed and put to sleep with dim lights, no fuzz and no playing. During daytime keep it bright and try to play them. That will be their first clue on nights and days being different. When your baby begins sleeping between 4 to 5 hour stretches at night, it is the perfect moment to start a bedtime routine and ritual. Be mindful that this routine will change with their age — and also with each individual child. My daughter needed a nightlight, music, stories, white noise (thank you, Sleep Sheep!). My son? Exactly the opposite: he needed to be as warm as possible and bundled up, no noise, no light. The first and most important thing is for you to be mindful and in tune with what your child needs: What makes them feel comfortable? What makes them feel secure? Also, my daughter was a thumb-sucker, while my son has been a pacifier baby since he was a month old — she used to fall asleep while nursing, while my son never falls asleep after having his milk. Once you establish what your child needs to go beddy-bye, stick to the same steps night after night. With my daughter it was putting her pajamas on, her sleep sack, reading a couple of picture books, singing a song, starting the Sleep Sheep and breastfeeding her. For my son it was putting his pajamas, sleep sack and breastfeeding, then pacifier and singing to him while on the crib, turning all lights off and keeping quiet. If you learn to tell your baby’s sleep cues, and then start the bedtime ritual, then your child is going to associate the feeling sleepy with the going to bed. Now my almost 18 month-old brings me his pacifier and blankie when he’s ready to go down for a nap or for the night. If you disregard these cues and prolong the going to bed, your child will get overtired and putting them down to bed (ritual or not) will become a battle… with a pretty heavy toll for both you and your baby. Make sure that whatever ritual you pick, it is something your child is looking forward to, as well as something you enjoy doing. This is for the long run — so, if rocking a child to sleep is not your thing, then avoid putting that into the mix. The simpler you keep it, the easier it is going to be to replicate night after night. These days Tiny A tolerates light better at night, so I just cuddle him to sleep while reading a book. Whatever bedtime routine you start, keep it going. There will be times when they start waking up in the middle of the night again (because of teeth, colds, tummy aches, or just because), but if you keep that first putting down to bed consistent, and keep middle-of-the-night interruptions in dim-light, with little or no talking, etc, your child will know what to expect. That being said, if you realize your child is just too tired, cut part of the ritual out (like stories or songs), and get right to the part when you put them down — having them go to bed with dirty feet is better than dealing with an overtired, cranky baby. Have you tried any of these ideas? What has worked for you?